A BUS has collided head on with a car in a busy city road leaving passengers and drivers with minor injuries.Paramedics from South Western Ambulance Service treated several people at the scene, in Saltash Road, Keyham, close to the Goschen Centre, shortly after 5.10pm today. 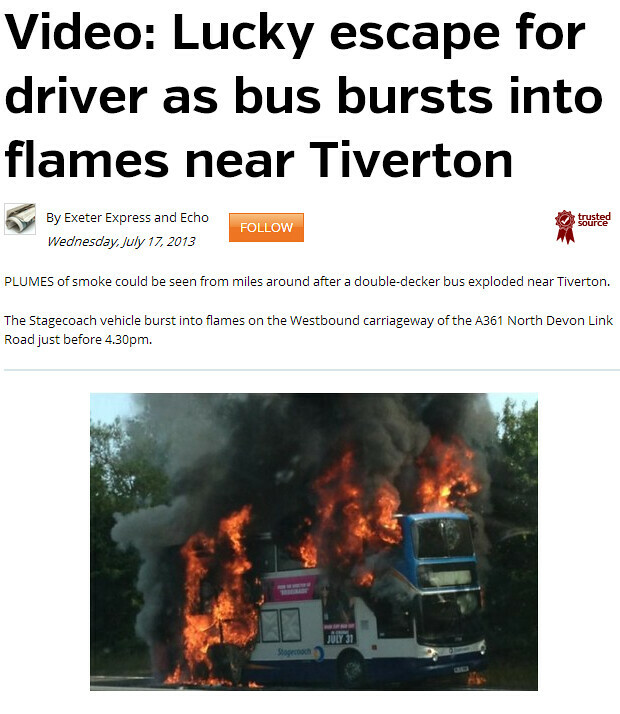 It is understood the single decker bus, owned by Target Travel, veered across the carriageway and into oncoming traffic. The bus and a black Audi estate car collided, writing off the smaller vehicle and causing severe front end damage to the bus. Police have said four people were injured including an elderly female bus passenger who was taken to Derriford Hospital with a suspected broken wrist. The driver of the bus was treated by paramedics at the scene for a knee injury while the driver of the Audi was treated for chest and neck pain. It is understood the police inquiry will be assisted by investigators from VOSA (Vehicle and Operator Services Agency). There is a video – but its just of the car being loaded onto a truck. I doubt that very much! it may hve had an electrical fire? or heat temps in engine bay too high? it may well have exploded... bearing in mind the fuel tank and glass imploding with the heat. Any idea on which Target Travel vehicle was involved in the incident?